I will admit that this is not my first rodeo. I completed a trip similar to this in late November 2016 just after taking ownership of my car in Los Angeles. I spent countless hours meticulously selecting interesting sights, charging stops, places to rest and food to eat. 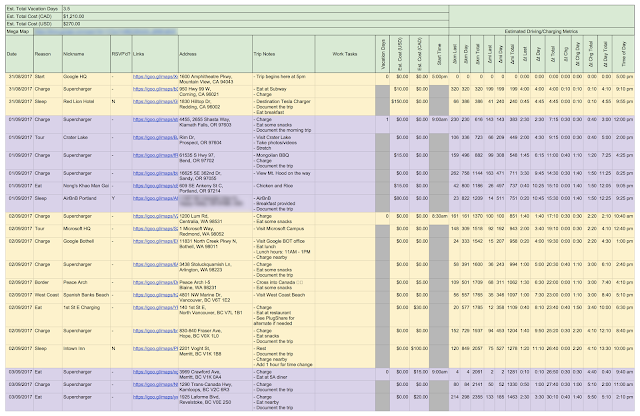 A spreadsheet tracks all details of the trip including addresses of destinations, distance between hops, estimated charging time, cost and more. 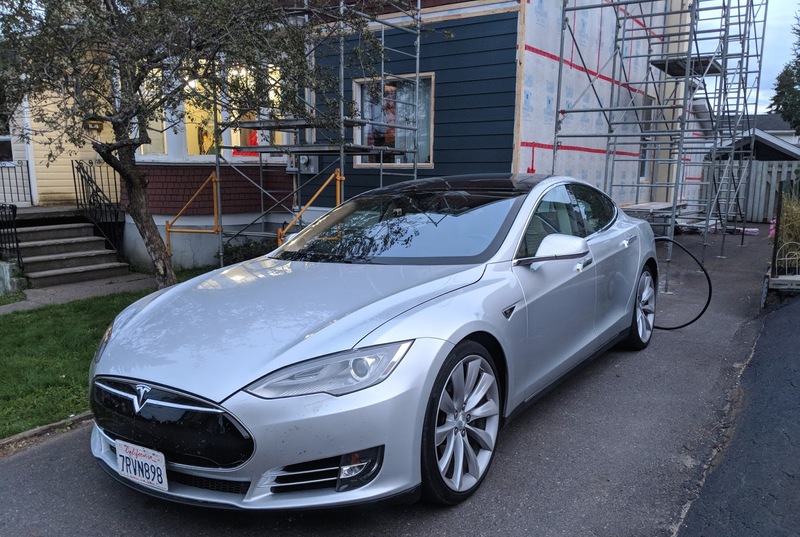 I drive a Tesla Model S with an 85kWh battery. It has close to 70000 miles on it and around 3% degradation (when charged fully, the reported mileage is 258mi from the original 265mi). 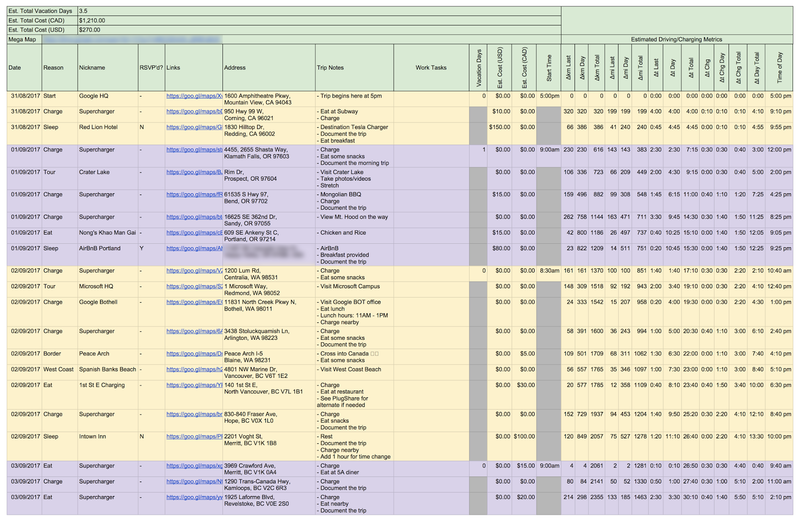 All of this information is used when estimating charge times. I make ample use of color to convey information at a glance. Purple and yellow are used to more easily discern between days and green is used for headers and legends. When details are missing for a stop the first cell of that row is colored red to call attention to it. All details for the trip were finalized when I left. One of the greatest resources available to EV drivers is PlugShare which allows drivers to locate chargers on a map. It also allows members to list their own private chargers to share with other EV drivers who are in a bind. 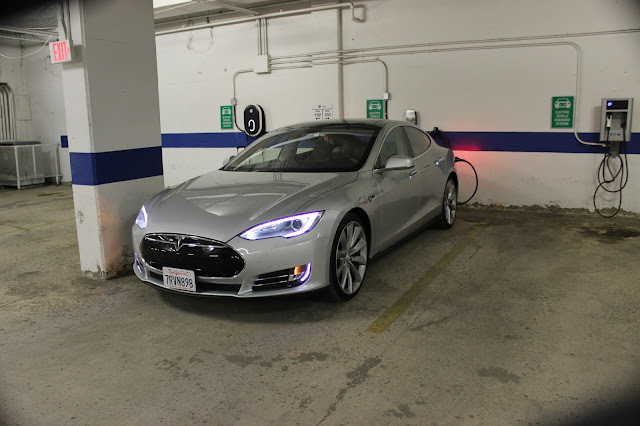 Ordinarily driving a Tesla is a piece of cake when it comes to charging. I live in an apartment complex with no dedicated L2 charger. I charge from a 120V outlet limited to 10A (roughly 1kW). This is more than enough for my daily commute. When I decided to venture into Canada and out of range of the Superchargers, I knew that it would be wise to bring some extra tools. Perhaps the most interesting is the Quick220. This is a device that will safely merge two out-of-phase 120V power sources into one 240V supply. This allows the car to charge at just under 3kW which is quite respectable if charging overnight. 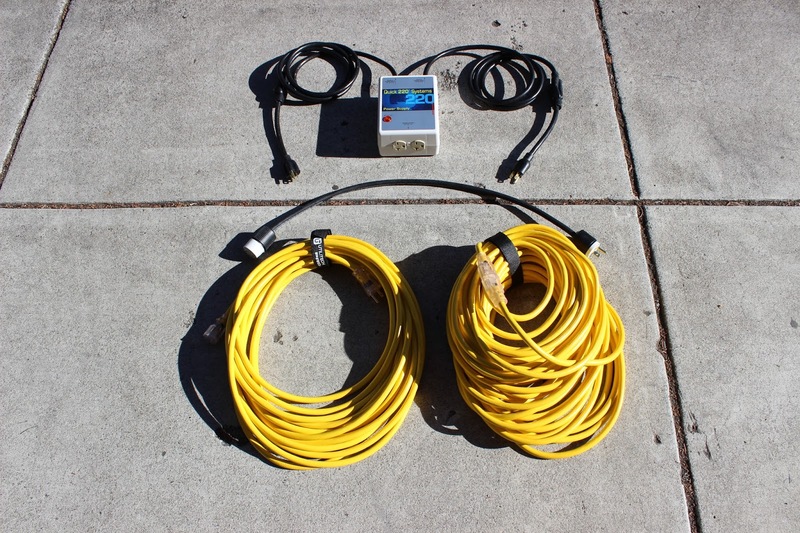 I also brought two long extension cords: 50ft and 100ft. The Tesla Chademo adapter ended up being handier than I had expected but there are limited L3 chargers in Canada. 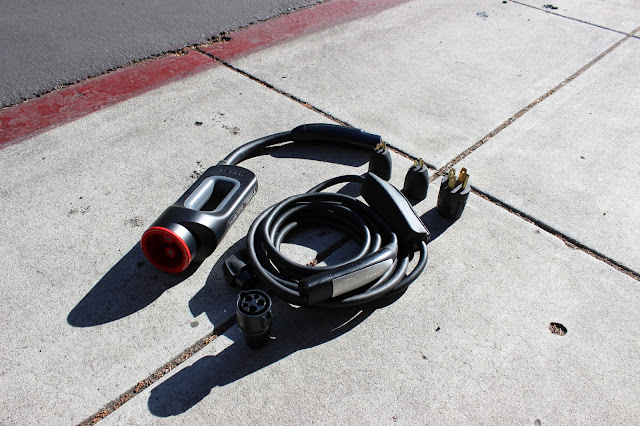 This adapter allows a Tesla to charge from standard L3 public charging infrastructure that is normally used by Nissan Leaf or BMW i3 vehicles. 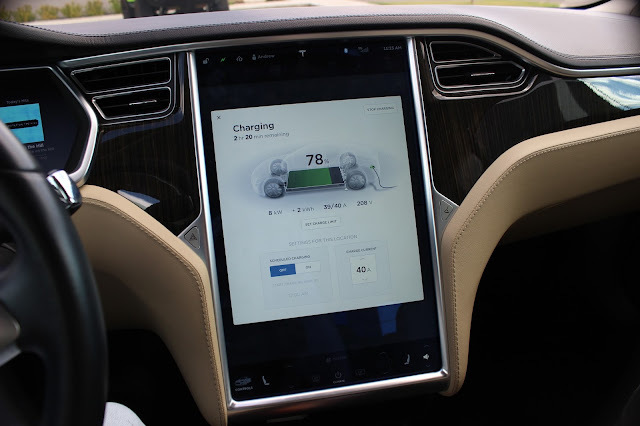 All of this is in addition to the standard Tesla Universal Mobile Connector (UMC) cable that is supplied with the car. I purchased the NEMA 5-20 adapter to go along with my setup. This allows 16A instead of 12A to be pulled from a standard 120V outlet if it has the correct connector. This was handy in Colorado, of all places. 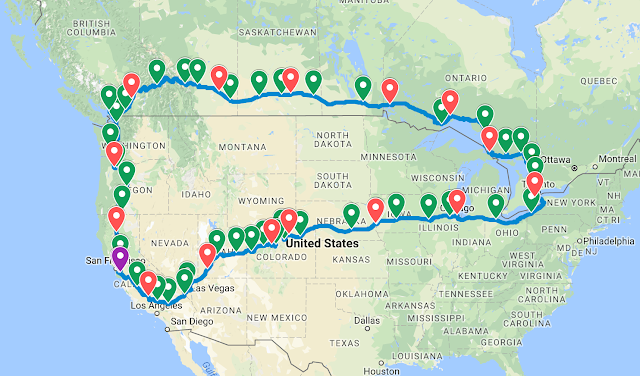 I used the J1772 adapter for all of the L2 charging required when crossing Canada. 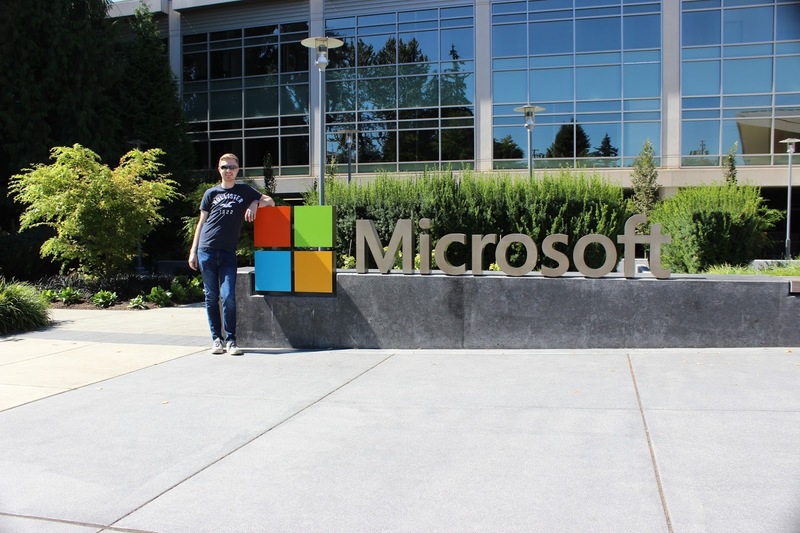 This trip started in Mountain View, California. I finished work earlier than normal at 4:50 and hit the road. The first stop was a hotel in Redding, just 5 hours north including a short charging stop where I would also eat dinner. I arrived at the Red Lion Hotel in Redding. They have a Tesla destination charger and it was available for my use. I plugged in the car, checked in and got a good nights sleep for the next day. 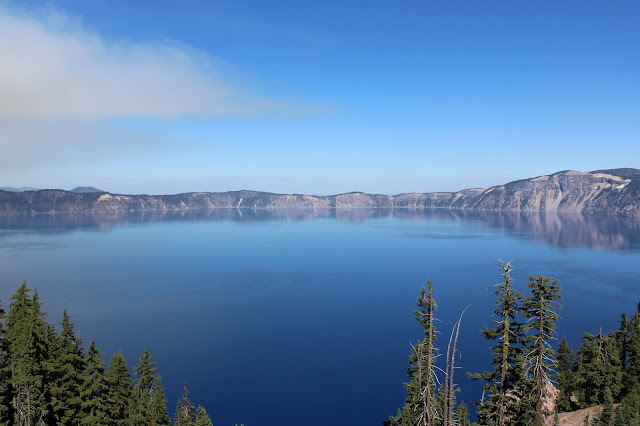 The first stop was to visit Crater Lake in Oregon. 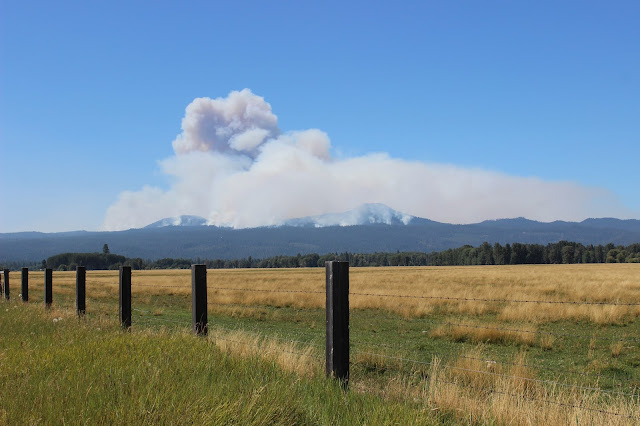 I encountered forest fires en route which was an impressive if uneasy sight. Crater lake was beautiful, despite being half filled with smoke. Road work added half an hour to my drive which would later make me late to an AirBnB in Happy Valley. The AirBnB host that I stayed with was pleased to let me charge from an outlet in her garage. 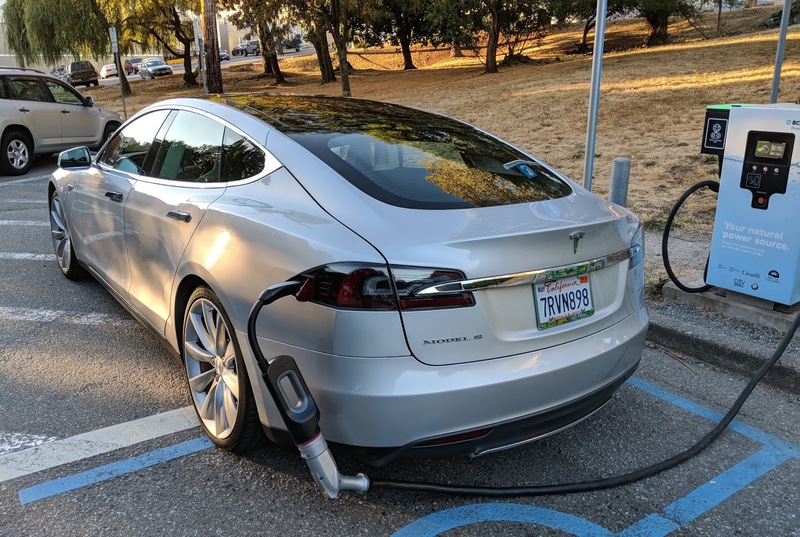 The host seemed excited to have her first EV customer and commented that she had never been so close to a Tesla and that they were very quiet. It is always fun to give someone a quick taste of what driving an EV is like. The next day I continued north and paid a visit to Microsoft on the way to Vancouver. I passed through Canadian Customs with no issue. The border officer asked me why I didn't drive through the US to which I responded: "I have already done that and want to try something new". He seemed entertained. 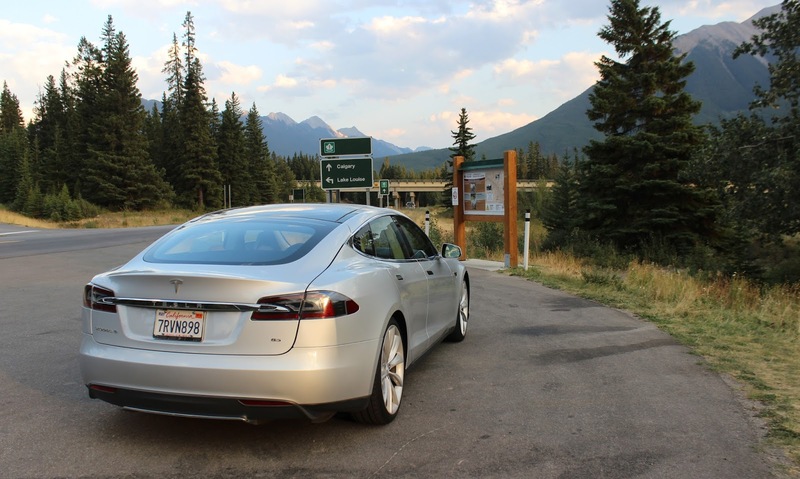 The next stop was North Vancouver where I used an L3 DC Fast Charger (DCFC) which kicked out 35kW. A small restaurant near the waterfront was a great place to relax while the car charged up. One of the great advantages of road tripping in an EV is that the charging time allows you to spend more time enjoying the sights. 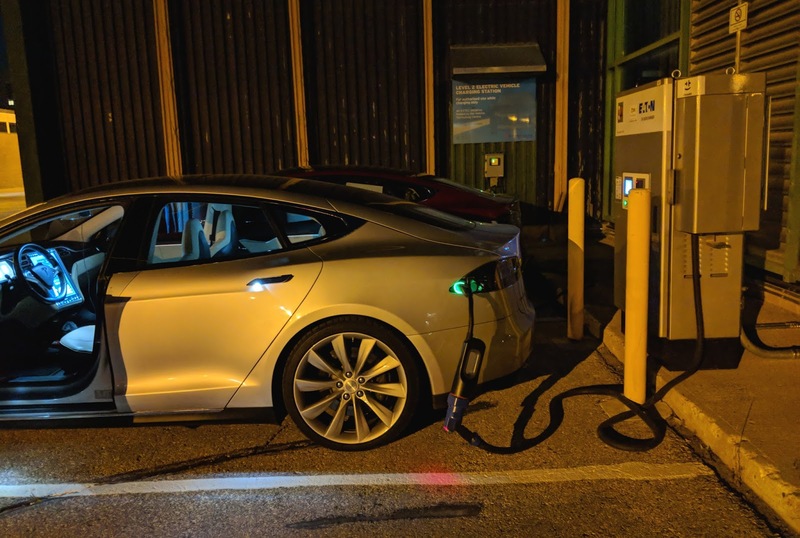 I stayed in a motel in British Columbia that has an L2 and L3 charger across the street. I opted for the L2 charger since I was planning to sleep and didn't want to block the L3 for anyone who would need it. I was at 90% in the morning which was perfect. The Rocky Mountains in British Columbia and Alberta were filled with smoke due to ongoing forest fires. Traffic was stopped for more than an hour in one instance and other motorists were getting out of their cars to chat. I joined in the fun and met a young couple from Denmark who were on vacation and a woman who was returning from a dog show. It was nice to chat with other locals who were speculating about the fires. Planes were flying over the hill in front of us and down into a nearby lake to catch water and attempt to extinguish the fires. It must have worked because traffic was allowed to proceed! 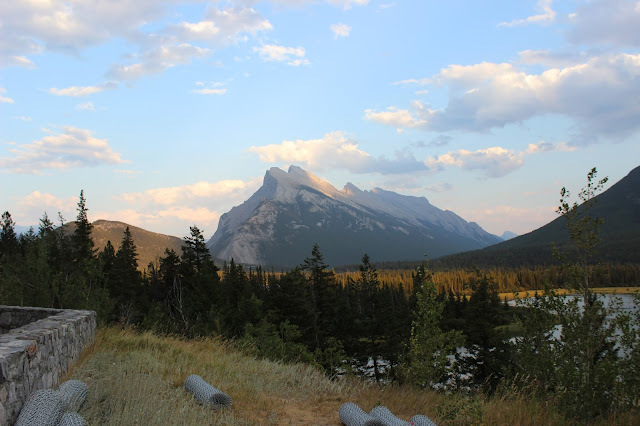 I arrived in Banff National Park and took lots of opportunities to take pictures. The skies were considerably clearer by this time as the smoke had cleared. The mountains were beautiful. Later this evening I visited an L2 charger in Calgary. I decided on a station located in City Hall because I assumed that it would not be occupied given that it was late in the evening. With the car charging, I set off on foot to find a place to eat, or so I thought. It became apparent that there was no way to exit the parking garage as a pedestrian without getting locked out. All marked exits had signage indicating that re-entry after a certain hour was impossible. I was effectively locked in, hungry and in need of a restroom. I spent 30 minutes trying all possible exits, but none of them would have worked. Eventually it was time to give up and I hit a McDonald's on the way out of the city heading towards my hotel. I left disappointed but with a ridiculous story that I will never forget. 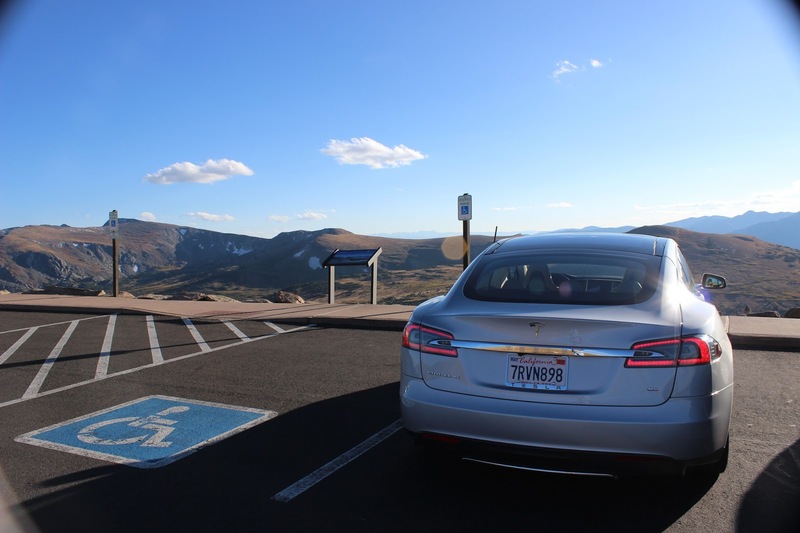 I continued east and eventually drove out of range of the Tesla Supercharger Network. This notice was unnerving at 10PM on the way to the next hotel. I made it to the Ramada in Brooks just before midnight with just 8% to spare. The charger was unoccupied and I was happy to plug in for the night. This is where the trip becomes a true experiment. 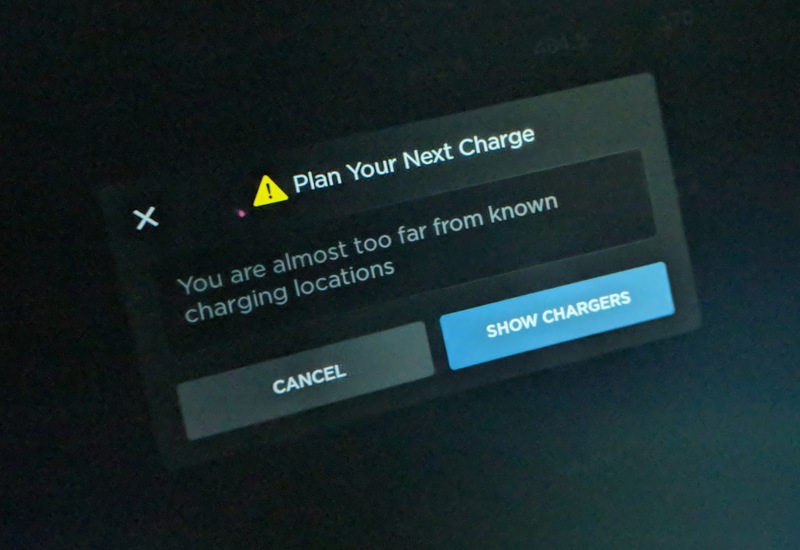 I no longer have the support of the Superchargers and am on my own when it comes to charging. 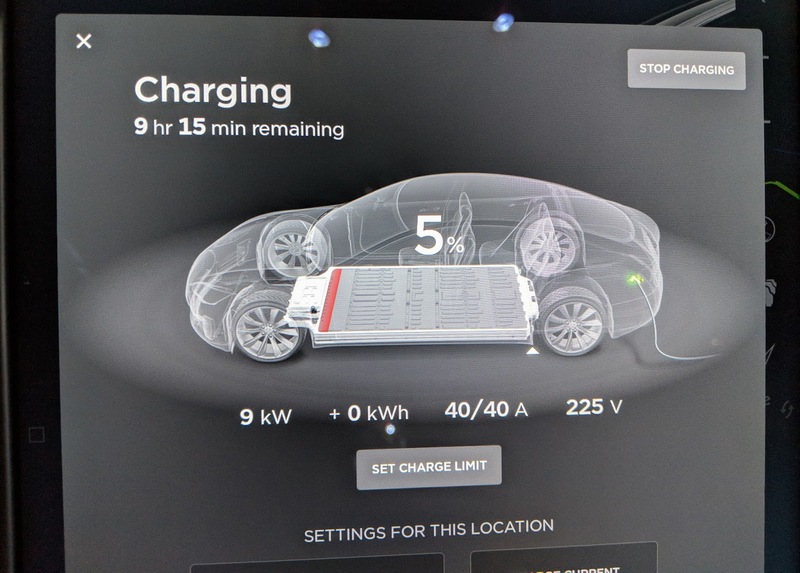 A brief math lesson is in order: the Tesla battery is 85kWh and most L2 chargers operate at 6-10kW. The one pictured here is running at 8kW which gives a charge time of 11 hours for 0-100%. The name of the game for the next few days is going to be patience. I budgeted these extended stops into the trip planner and it worked out for the most part. I rarely let the car drop below 10% and almost never needed a full 100% charge during the day so most of the stops were 4 hours at most. I woke up just on the other side of the Rocky Mountains and continued east. 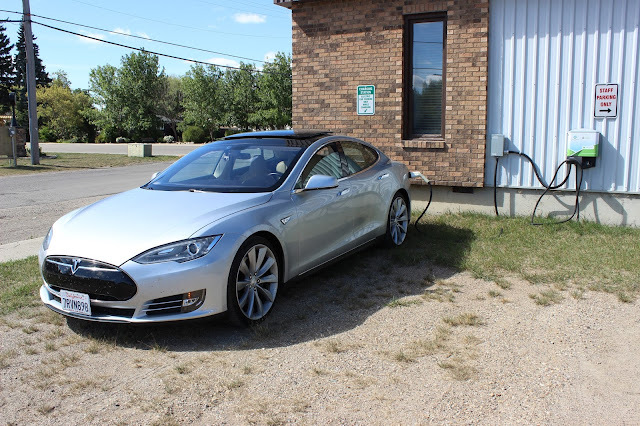 I stopped at my first L2 charge of the day in Medicine Hat. There was a Tesla destination charger that I took advantage of while eating at the nearby Boston Pizza. The prairies of Canada are very flat! At this point the land still had undulations. As the day continued it became flatter and flatter. It really makes this famous clip from Corner Gas ring true. I stopped in a town called Swift Current where a company called Superior Tech has graciously mounted a Tesla charger on the front of their building. I signed myself in on PlugShare to let others know that the charger was operational. A few moments later, a Tesla Model S 90D came barreling around the corner with the driver waving. He owns the shop and was a delight to meet. 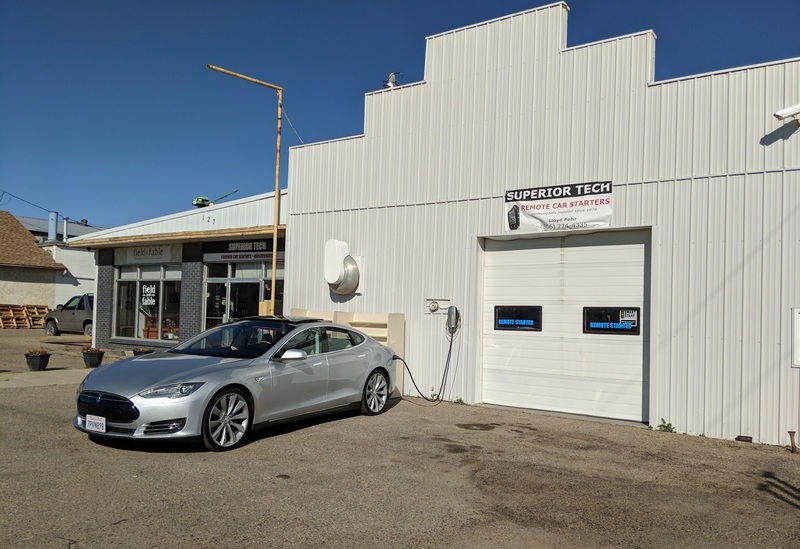 We discussed a variety of techie things and I learned that there are only 13 Teslas in the entire province of Saskatchewan and that he has one of them. I showed him my Quick220 and we compared the cars. His is much newer than mine. It was a great meet up and we ended up having dinner together. Thankful for the charge I continued on the road east. I was headed to Regina to stay at a DoubleTree that had another destination charger. I was not able to make the trip without one short charge on the way so I made a stop at a Peavey Mart between Swift Current and Regina for an hour. This gave me enough charge to comfortably make the rest of the drive. I was spending most of the charging time on this trip working remotely so the time was put to good use. The first stop after Regina was in a small town called Whitewood. The township was kind enough to install this charger on the back of their building. I brought my Boosted Board with me on this trip to ride to restaurants while charging. Unfortunately I took a tumble in this town and scuffed up my arm. Thankfully it was a minor injury. I was able to get some bandaids from a local gas station which doubled as a Subway and was back on the road in no time. I spent a few hours working on my laptop while the car filled up. At this point, I had begun to realize that my day was over scheduled. I needed to be in Kenora, Ontario to stay in a hotel which has an L2 charger. Unfortunately, this charger is a necessary stop to make the trip to Toronto. I had to change my plans slightly and route myself to an L3 charger in Winnipeg. This charger is part of a research project at a local college to determine the effectiveness of EVs in the cold Canadian winters. Thankfully I was able to get a quick charge and I met a fellow Tesla owner who is a nursing student at the college! It was a delight to chat and share stories. 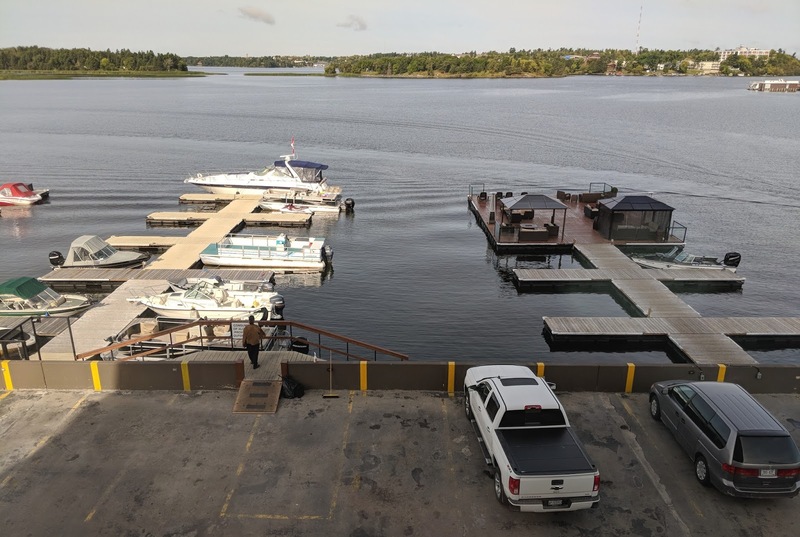 After spending some time at Red River College, I was able to make it to the hotel in Kenora with just a little battery left. The hotel owners have a "No Parking" sign in the EV space that I moved and was able to charge for the night. This day was a little longer than planned and I did not get to the hotel until 2AM. I did get a good nights sleep once I arrived. I slept in the next morning to catch up on some sleep. The hotel was comfortable and the views were great. The car was at 100% and ready for another day of driving. The next day I was headed towards Nipigon, Ontario. There is a hotel there that is essential to complete the trip through Northern Ontario. On the way, I stopped to meet a PlugShare user in Thunder Bay who listed their Tesla charger for use. The owner of the home was very hospitable and we ended up having Thai food in his kitchen. I met his family and lovely dogs. It was a humbling experience and nice to meet the young family. I arrived in Nipigon with 5% remaining, the lowest I had been on the entire trip. The chargers are not spaced very closely together in Northern Ontario and I must have underestimated the time needed to charge up. I try to avoid allowing the battery to get this low to preserve the overall lifespan of the pack. So far I think the 3% degradation is fairly good given the age and mileage of the car. 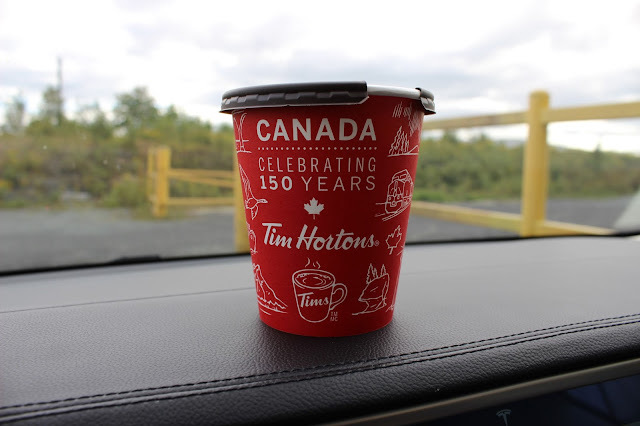 I am not sure why it took me so long, but I ordered my first Tim Hortons before stopping at an engineering firm called Ionic Engineering. They have a Tesla charger on the side of their building and accept donations for the local Food Bank in exchange for a charge. This charge was only necessary because an L3 charger failed in Elliot Lake while I was using it. The entire unit powered down with no signs of life. I suspect I may have tripped a breaker somewhere, but it cost me a couple of hours because I had to find a new charger and then wait. 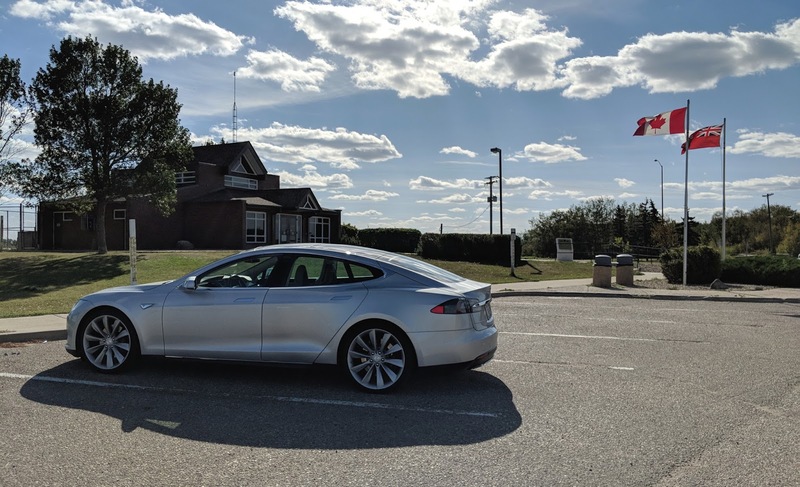 The next stop was in Parry Sound where I finally reached the first Supercharger in Southern Ontario! I was so excited that I forgot to take a picture. Later this evening I arrived at my parents home. By this point I hope that you can appreciate the value of the Superchargers or at least why I called Canada an EV Desert. Over the course of this journey, I encountered zero mechanical issues with the car itself. However, my tires were worn and I knew that when I left. By the time I had arrived in Southern Ontario, I had developed a slow leak in two of my tires. 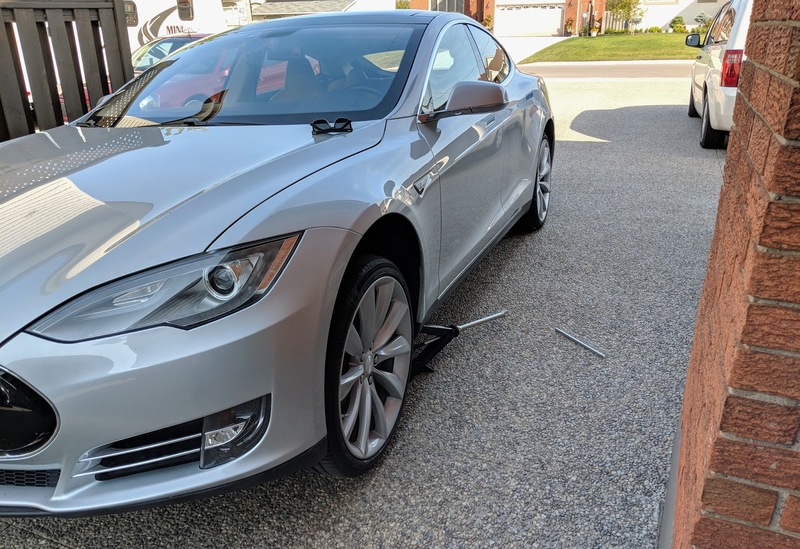 I scheduled an appointment with Tesla to have 4 new tires installed and an alignment for the return trip. The technicians found a nail in one tire and that the rims had gone out of round. The next morning after I had my new tires installed, one had gone completely flat. I pulled it off with my Dad and we discovered a small hairline crack in the rim when placed under soapy water. A local tire shop called TireHaus was able to straighten my rims and repair the crack with a weld. They had it done in just a couple of hours. The service was fantastic and I saw a noticeable improvement in efficiency (30-40Wh/mi). I had experienced excessive tire wear before but chalked it up to a bad alignment. The return trip to California was great. I won't get into great detail here as there are loads of blog posts around that show people driving around the US on the Supercharger network. I made a stop in the Rocky Mountains, visited Hoover Dam and just generally enjoyed myself. The only major issue was that there were very strong headwinds starting in Colorado that pushed my consumption to 450Wh/mi in many cases. This just means more charging. The Superchargers are plentiful so it was not a major burden. This trip has been the experience of a lifetime and I am thrilled that I was finally able to do it. The plan was to take this trip last year but delivery of the car was delayed. I decided to avoid the harsh weather in Canada then and save it until now. It was a busy vacation, exhausting at times, but I think a great use of the free time that I have and something that I will remember for the rest of my life. Thank you for sharing!! Quite the adventure. Remind me of my travels in Appalachia before the recent supercharger growth. That Quick220 is really coo, might have to invest. I really appreciate the GIFs, what did you use to mount a camera on the side? I used the standard GoPro suction cup mount. It is rated for high speeds. The original footage is far more impressive but heavy compression is needed to make it load in a reasonable amount of time. How does payment work for all the different types of charging?